Years ago, I picked up this single in a charity shop – but sadly just the sleeve. 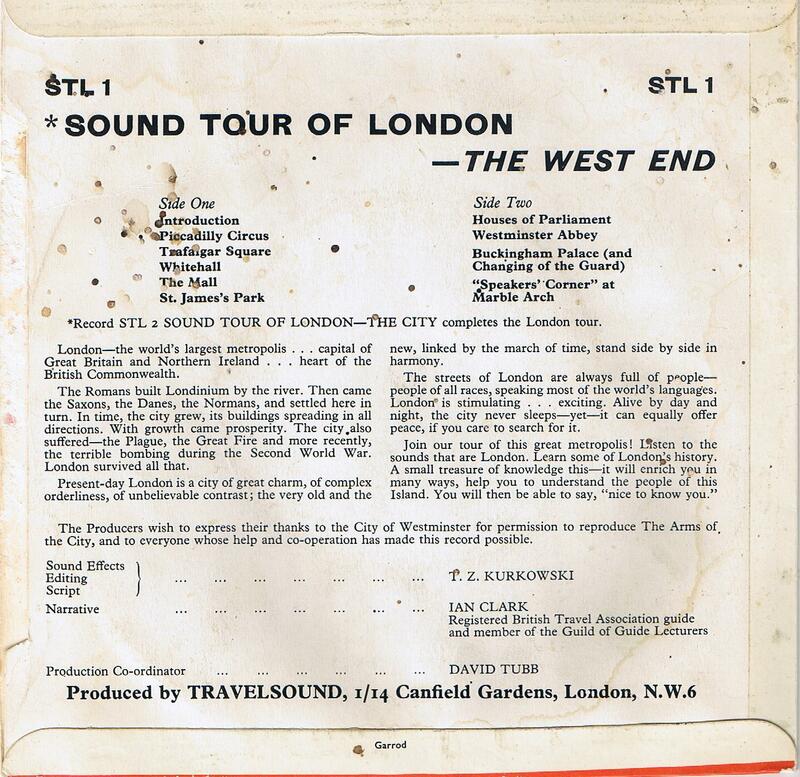 With no record inside, the actual recording of Sound Town: London – The West End remains a tantalising mystery. 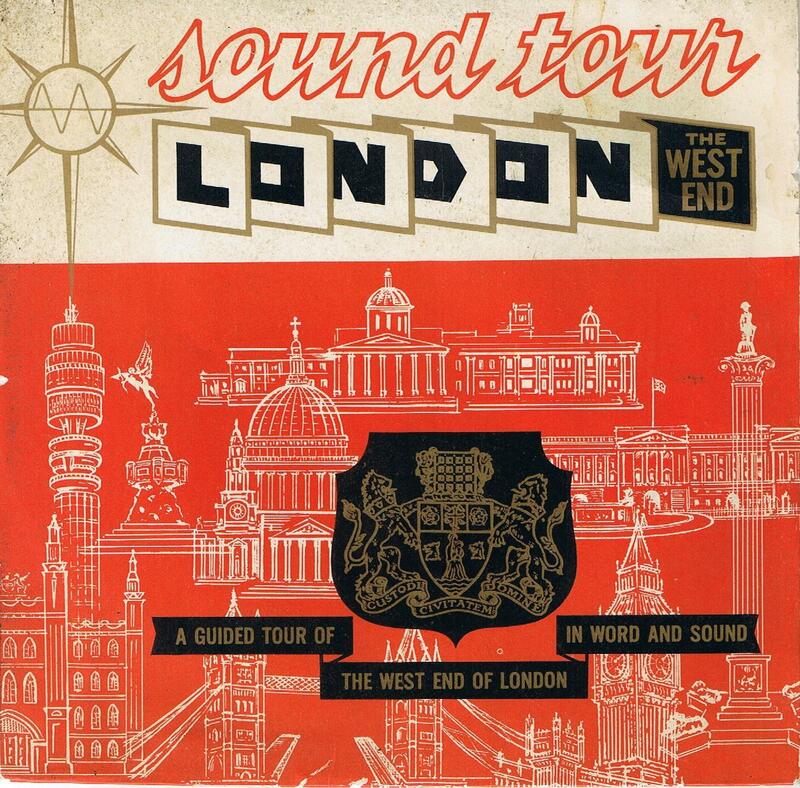 It’s undated, but the inclusion of the BT Tower (which was completed in 1964) on the sleeve means it was released in the mid-1960s at the earliest. I’d always presumed it would consist of field recordings of noises, ambient sound or conversations – a prototype art project – but looking at the back, one T.Z. Kurkowski is credited with the script, which was read by Ian Clark, a registered British Travel Association guide. In some ways, it’s an early prototype of many of the modern London walking tours you can currently download through iTunes, where someone takes you on a walk in real time, their commentary running over the sounds of the roads they’re walking down and the sights they stop outside. The track ‘Speaker’s Corner at Marble Arch’ is the one I’m keenest to hear – for something which has been running for so many years, it’s shocking how meagre a selection of recordings seem to have been made at Speaker’s Corner. In recent years, it seems to have fallen off the list of tourist destinations, but having wandered over a few months back, it’s as full of racists, cranks and End-Is-Nigh-ers as ever.